Located in the heart of Macau, Yoga Loft sits on top of an elegant colonial building overlooking the Senado Square. High above the crowds, a deep sense of peace and clear energy is felt when we are in this space. The studio’s teachers are one of a kind. In a perfect balance between technical mastery and spiritual insight, they never sacrifice quality for quantity. Classes are small and structured in a way that doesn’t leave people feeling abandoned. If someone in the room is doing something incorrect, the teachers will make sure they are well taken care of. A strong “Kula” - community spirit - is present at Yoga Loft, where people share good laughs and beautiful moments together. 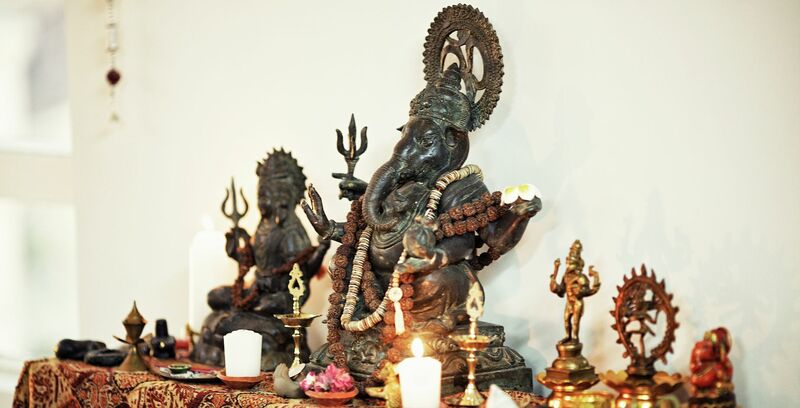 Yoga Loft is also an holistic center for many guest workshops, and has hosted events on Sound Healing, Voice Exploration, Movement Awareness, Pilates, Feldenkrais, Ayurveda, Kung Fu & Self-Defense, Astrology, HeartMath®, Family Constelations, Sacred Feminine, the Louise Hay Method, Ecstatic Dance and Self Empowerment Course. Follow us on our Facebook page to stay up to date with the latest news! Stay tuned! - Attendance of one group class just to see what it’s like. - Private class & interview to understand your needs and establish your yoga program for the coming months. - 50% off your annual enrolment fee. Come and discover yoga today! Sacred Place will deliver a Self Empowerment at the Yoga loft this coming Chinese New Year holiday. There is a 20% early booking discount. It was a hunger for profoundity in her own life that propelled Rita into a yoga journey. In an age where people have lost access to the true wisdom of their bodies, and where asana practice is measured by its “instagram worthiness”, Rita stands out as someone that is authentic and genuinely commited to this ancient art of union of body and mind. This loyalty to yoga is palpable in her adjustments and words: she will never abandon students in a wrong position, and is playful and caring, but straightforward. 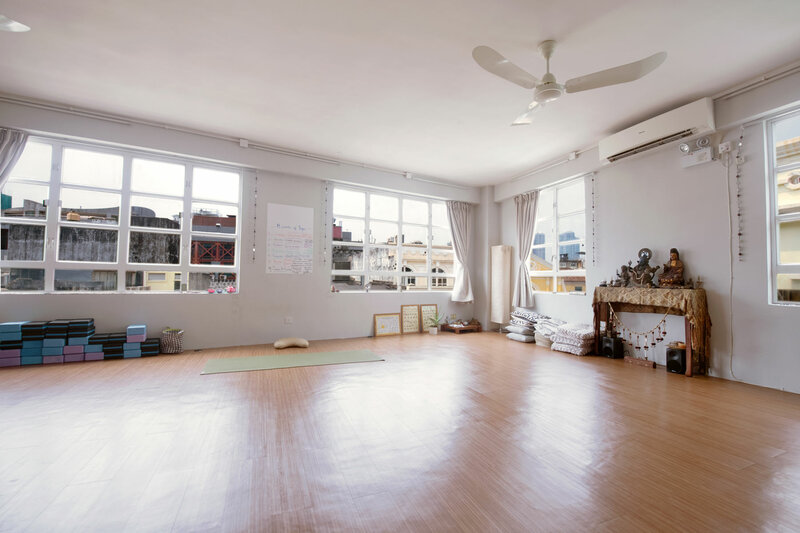 At Yogaloft, her intimate studio in Macau, China, she plays with the yin and yang energies, balancing Gentle Hatha classes at sunset with fiery Vinyasa Flow at noontime. Rita has been studying and researching since 2009. In India, the Sivananda training gave her solid roots that sustain her knowledge of mantra, yoga nidra, and Vedanta philosophy. In France she explored Pilates and deep relaxation in its western form (Sophrology). In Portugal Rita became an Energy Therapist (Reconnection). She also studied online with Leslie Kaminoff (Anatomy, Yoga Therapy), Noah Mazé and Jason Candrell (Sequencing for Vinyasa Flow). A lover of Ashtanga Vinyasa yoga, Rita regularly practices with Tariq and Lea in south Portugal, and completed a 200 hours training with Paul Dallaghan in Thailand. Over the years she has had the honour of practicing with Manju Jois, David Swenson, Ana Forrest, Simon Low, Dharma Mittra, Tomaz Zorzo, Isa Guitana, among others. She is currently doing online studies on Yoga Psicology with Ashley Turner. Want to see student testimonials? Click here for our Q&A. Want to know our code of honor? "I attended Rita's classes at Yoga Loft three times a week for a a period of 6 months and appreciated the experience on many levels. The sessions were calm, focused and powerful requiring dedication from the participants, creating a committed, social environment in which to practice. The classes also incorporated the mental and spiritual elements of yoga as well as the physical discipline. A month since my last class there, and having returned to my daily life in England, I can clearly see improvements in my mental wellbeing, physical activity and in my general outlook on life. I only wish Rita ran classes in England!" "I was practicing Yoga for over one year when i met Rita, at Yoga Loft. The experience had been positive up until then, but I used to see the practice as a set of poses I would do because I would receive the instructions from teachers, without really looking for the sense in the sequencing of one pose after another. With Rita, Yoga gained another dimension and became a lifestyle in which the most important thing is to respect ourselves and our bodies. What makes her different as a teacher is not only her vast knowledge of Yoga as a philosophy and physical practice, but also the passionate and unrelenting way in which she shares these with her students. How many other teachers know all their students by their names? The respect she has for us as individual yoga practicioners, with special needs and limitations, is always present in her choice of pose adaptations, adjustments, and her incentive to try a more advanced version of a poses in the right time, and with the obvious joy in which she witnesses our evolution"
Developed by Sri K. Pattabhi Jois, Ashtanga Vinyasa Yoga is one of the oldest and most respected lineages in the world of Yoga. Intense and transformative, this type of yoga will make you stronger and healthier. Get ready to sweat and smile. In the tradition of the practice, we offer Led Group Classes, where the teacher introduces students to the classical sequence of postures. The sequence is dominantly a standing practice with poses that focus strongly on the legs, followed by seated forward bends and twists where we get deep into the hips. Practice finishes with cooling down backbends, inversions and savasana. A smooth yet powerful practice, this classic hatha yoga class is for all levels. It has a very a relaxing pace: unlike other dynamic practices, in Sivananda we stop between poses to breathe and observe the effect these poses have in the body. The sequence has an inward meditative quality, and creates space for release in typically blocked areas - lower and upper back, chest, throat, head. A class usually begins with mantras, pranayama (breathing exercises) and meditation, followed by sun salutations and various therapeutic postures designed to rejuvenate and improve your overall body posture. Practice finishes with everyone’s favourite - Savasana - a long and pleasant guided relaxation. Vinyasa is the Sanskrit word for "count" and "coordination of breath and movement". Stemming from Ashtanga Vinyasa Yoga, this Americanized version of the practice takes the classic sequence of Ashtanga and plays with it. The session is intense, aerobic, and designed to make you sweat away toxins, lose weight, gain muscle strength, and increase flexibility. One month of regular practice will bring you fast results: increased lung capacity, strong arms and legs, toned abs, and a beautiful realignment of the chest and shoulders. In this class we stretch and open the body lines. Easy poses and simple breath exercises help to release mental and physical tension in an easygoing way. Depending on the energy of the group and day, sometimes we do things slowly, with grounding poses that help us to relax. Sometimes we do a more intense practice, with fun standing balances that are challenging but still accessible. This class is ideal for beginners or anyone that wants a little energy boost, an oportunity to relax, and an effective way of correcting their posture. Many newcomers to Yoga complain from lower back pain or tension in the neck and shoulders - probably due to strain of too much hours of office desk work… In postural yoga we address these problem areas with exercices that involve slow movements that stretch and readjust the body position of the shoulders, hips and spine. We work with leg and hip stretches, cat/cows, variations of bridge and many other realigning poses. This class is ideal for students with tightness/pain in the above mentioned areas, or anyone who simply feels they need a slower, gentler practice. Q - I would love to do yoga but i’m too stiff! A - That’s why you should come to yoga! It will make you stretch and correct your posture. Q - I want to lose weight, can yoga help? A - Yes, it will tone your muscles and make you discover strenght you never knew you had! Q - I’m over 50 and haven’t done sports in a long time, is yoga good for me? A - Yes! Gentle Hatha and Postural Yoga are perfect practices for you. Q - Is yoga going to make me relax more and feel better? Is yoga going to help me clear my mind and get more focused? A - Yes! We have all heard the phrase “Yoga brings health to both body and mind”. But what does this mean exactly? Scientists have proven that yoga poses and breathwork have a physiological effect on our nervous and endocrine systems, and create signals in the brain that tell us to relax and feel good. Yogis have long understood that yoga practice is basically a laboratory where we use the body as a tool to understand and calm the mind. That is why yoga is sometimes called “Meditation in movement”. Yoga Loft is an authentic yoga studio. We foster an intimate environment where people feel comfortable and welcomed. That is why our classes are small, and we know all of our students by their names. We know their body history, and their personality. When teaching class, we work with the group energy, but take care of each and every person individually. If a student does a pose incorrectly, we stop to explain, or we talk to them at the end of class so they can understand the pose better. In our studio we are not looking for “picture perfect” poses - because our bodies are all different, we must all find the right adaptation of a pose so that it can benefit our personal needs. We all know that life will have its ups and downs, joys and disappointments - Yoga is there to help us navigate the currents. Our hope as teachers is that we can facilitate that experience for you, and that our studio is the space for you to find it. In Shiatsu & Anma Massage, the therapist applies pressure, touches and strokes the client’s full body (muscles). He first looks for some bad and good points of the body, and then pressures those points. Sometimes the therapist acts fast, and sometimes slow, some actions are deep and other lighter, because different ways of touching have different effects on the body. Then, when the muscles (body) are able to finally relax, this means that the body is going to be in the “right” position. Thai Massage is a full body pressure and stretching technique that works with the body’s Sen-Lines (energy lines in Thai Massage). This type of massage is slow and easily brings relaxation to people. Thai Massage has several stretching techniques. What makes “Full Body Stretch Massage” different is that the therapist stretches several points together at the same time. For example, he places the legs of the client in a certain position, and then focuses on the stomach or shoulders. With this technique, we can stretch the body in 3 to 4 points more than in a typical Thai Massage session. Our energy body is a blueprint of the physical tensions, blocked emotions, and negative thoughts we carry around. Energy healing has many forms, and reconnective healing is a very special one. After clearing tiredness and accumulated stress, these special reconnective energies help us “remember” what we sent out to do in this current lifetime. 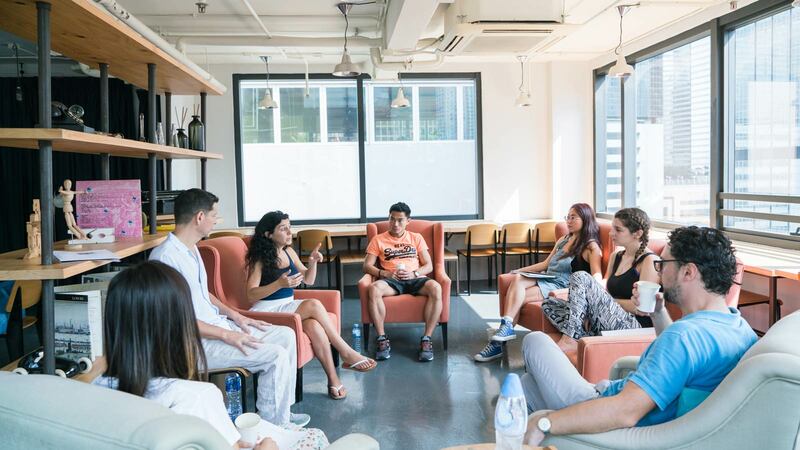 Some people compare reconnective healing to a transcendental experience, like past life regression, karmic cleansing, or an ayuhasca experience. What we must understand is that we humans are capable of high psychic powers, and when aided, we can receive information from our guides or angels about who we are and what we came here for, in this current lifetime. The reconnection is one of the many doors we can use to enter this portal of communication with our higher selves. But what actually happens in a session? The therapist will activate her hands and subtle sensibility; interacting with the person that is lying down and that will go through several physical, mental or emotional sensations, visions, sounds... Each experience is unique, and brings something to that person that was tailor-made to his/her needs. There will be an intense energetic cleaning and realigning, this will have its due effects on the emotional (healing emotional wounds and memories), on the mental (clarifying doubts, clearing fears) and the physical (healing diseases, addressing limitations). The reconnection is, in short, a process of voluntary healing, and a beautiful mystical experience that helps us on our way towards the fulfilment of this life’s objectives. Yoga Loft Macau recommends the services provided by our beauty partners. These local “home” businesses offer good quality beauty treatments at a very reasonable price. With over 30 years of experience, this beautician will remove unwanted hair with no pain and leave the skin feeling smooth and soft. She uses a special type of light pink wax, “Cirepil Rose” from Perron Rigot. Imported from France, this low temperature beeswax is gentle on the skin, with long lasting results. Open since 1992, this cozy home is the perfect place for that simple and effective facial and hand treatment. A-In is a very experienced beautician, and will choose the right treatment for your type of skin: anti-aging,firming, pore-cleansing, etc. Using Japanese and French products, she does wonders with her hands, and her tweezers – believe it or not, you can fall asleep when she’s removing your facial hair! Based on Yoga Relaxation (Yoga Nidra) and in western relaxation techniques, Guided Relaxation is a therapy where we dive into a very peaceful state, all with the help of the calm soothing voice of the therapist and gentle relaxing music. The person begins by explaining how he is feeling, and what brought him to the session. The therapist then invites him to lie down comfortably, close his eyes, and follow her voice, a bit like in Hypnosis. The person is always conscious of what is happening, and witnesses a deep release of all of the body's muscles. The therapist’s voice then takes the person to a deep alpha state, and guides him through several visualizations, and other exercises that are designed to help us release blockages. Reaching a state that is very close to that of a deep meditation, the person lets go of the usual mental and physical agitations, embarking on a beautiful inner voyage where he feels at peace.